Techno 5050 Wafer Check Valves | pdblowers, Inc.
Techno 5050 dual-plate, metal-hinged, wafer-style check valves are available in a variety of materials to fit your application. pdblower standard 5050 valves feature cast iron body (ASTM A351 Grade CF8M), 316 stainless steel internals (ASTM A351 Grade CF8M), 316 stainless steel spring (ASTM A313), and EPDM seal. The dual-plate design produces increased strength with reduced opening and closing time. Clamp plates offer additional strength to valve plates and allow seals to be changed easily. Specially designed flat, full-contact seals maintain positive shutoff at low working pressures. Unlike most other valves, these seals are replaced easily in the field. Torsion springs assist valve plate closure, preventing flow reversal. Consistent valve response ensures against slamming and water hammer. 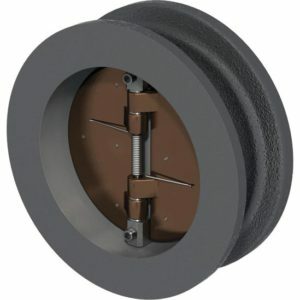 The shaft features heavy-duty, corrosion-resistant construction. Shaft supports act as stops to prevent over-travel of valve plates. They are corrosion resistant with large shaft-bearing surfaces and are easily removable for internal assembly, maintenance or change. Thrust washers reduce friction and wear of valve plate hinges. Techno offers a wide variety of wafer bodies in different styles and materials. These can be assembled with different disc, spring, and elastomer seal choices to make a valve that exactly fits your application. Contact pdblowers if you would like a quote on any of these options. pdblowers supplies both the 5050 Series from Techno and the 31 Series from US Valves. These valves are equivalent in performance, materials, and dimensions. The main functional difference between the two is the retainerless design of the Techno 5050 series. These valves feature a center post that fully supports the internal assembly without any external pins or plugs, so there are no holes and plugs in the body which could potentially allow fugitive emissions to atmosphere. If you have a gas application you may want to consider a 5050 valve from Techno or contact us about a retainerless option from US Valve. The other difference is the lower cost and wider availability of the standard US Valve 31 series. At pdblowers we keep some models of the 31 series in stock and, when they need to be ordered from the factory, lead times are typically only a few days. Average lead times for Techno 5050 Valves are 1-2 weeks.